Shares rise to an intraday high after a JP Morgan analyst said the company could release a smaller, cheaper version of the touchscreen phone this year. NEW YORK (CNNMoney.com) -- Shares of Apple hit an all-time high Tuesday after an analyst said the company could be launching a cheaper version of the iPhone, based on the iPod Nano music player, later this year. Apple's (up $2.34 to $132.67, Charts, Fortune 500) shares hit an intraday high of $134.50, before settling up 1.8 percent Tuesday afternoon on the Nasdaq. Kevin Chang, a JP Morgan (Charts, Fortune 500) analyst based in Taiwan, cited unnamed sources in the supply channel and an application sent to the U.S. Patent and Trademark office for his July 8 report. On July 5, Apple filed a patent application for a a multifunctional handheld device with a circular touch pad control, similar to the ultra-slim Nano's scroll wheel. Long lines of people turned out June 29 when U.S. sales began for the iPhone, a mobile phone with a music player and Web browser. Analysts have estimated that sales in the first weekend were as high as 700,000 units. 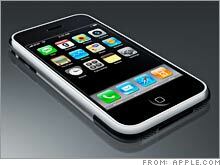 The current version of the iPhone sells for $500 and $600, depending on storage space. Chang said one way to follow up the iPhone with a cheaper version would be to convert the Nano into a phone and price it at $300 or less. "We believe that iPod Nano will be converted into a phone because it's probably the only way for Apple to launch a lower end phone without severely cannibalizing iPod Nano," he said, noting that the new phone could have "rather limited functionality." Another analyst, Gene Munster of Piper Jaffray, said he expects Apple to bring out iPods that resemble iPhone, which features a touch-sensitive screen, later this year. Such products would help stop iPhone from eating into iPod sales. "We believe the iPhone reveals much of what the iPod will soon be," Munster said in a note to clients, adding that "iPods with some of the touchscreen features of the iPhone should lessen the impact of cannibalization." Kerris also declined comment on Munster's note. The United States of Technology? Because of the anticipated lower price for the Nano-based phone, 2008 sales of 30 million to 40 million units "is achievable," according to JP Morgan's Chang. This would be a much larger volume than is expected of the first iPhone. Apple has targeted sales of 10 million units in 2008, which would give it a 1 percent share of the global market. Sales of the iPhone are expected to be limited to a small percentage of the market due to its high price tag, particularly in the United States, where 85 percent of consumers tend to spend $100 or less on cell phones. But analysts forecast that a cheaper phone from Apple, which leads the digital music player market, could pose a much bigger threat to long-established phone makers such as Nokia (Charts), Motorola Inc (Charts, Fortune 500), Samsung Electronics Co. Ltd. and Sony Ericsson, owned by Sony Corp. (Charts) and Ericsson (Charts). Taiwan's Catcher Technology will be the "major source of metal casing" for the new phone, according to Chang, who cited an unidentified channel source. Revenue from Apple could represent T$6 billion ($183 million) to T$8 billion ($244 million) revenue for Catcher in 2008, Chang estimated.